Treatment options for patients with metastatic colorectal cancer continue to advance as the therapeutic implications of the molecular subtypes of this disease are becoming better understood. DNA sequencing and mismatch repair assessment are now standard of care analyses for patients with metastatic colorectal cancer This review describes important aspects of the biology of the clinically relevant molecular subtypes of colorectal cancer based on the current standard of care testing. In addition, the clinical treatment strategies available now and potentially in the future for these colorectal cancer subtypes are discussed. Currently, for metastatic colorectal cancer, standard of care molecular testing is done for mutations in exons 2, 3, and 4 of KRAS and NRAS, and BRAF V600E. Testing for mismatch repair (MMR) deficiency/microsatellite instability (MSI) status is also done. These aberrations are well known to change the clinical prognosis and guide patients’ treatment strategies. Additionally, three new subtypes have emerged: PIK3CAmut, HER2 amplified, and NTRK fusions. With the addition of these emerging subtypes, tumor heterogeneity further validates the need to examine mCRC as a heterogeneous disease. Here, we present recent exciting data from translational research and clinical trials exhibiting possible distinct treatment strategies for these different subtypes. Altogether, these data show promising treatment strategies for many of these well-known and emerging subtypes of mCRC. In addition, these also give better clinical prognostic and predictive information. We believe that as molecular testing expands, PIK3CA mutation, HER2 amplification, and NTRK fusion molecular testing will be included in standard of care analyses. This incorporation of testing in clinical practice will generate further information regarding prognostic and therapeutic options for these and other CRC subtypes in the future. This project was supported by P30 CA014520 (Core Grant, University of Wisconsin Carbone Cancer Center). Rebecca A. DeStefanis declares that she has no conflict of interest. Jeremy D. Kratz declares that he has no conflict of interest. Philip B. Emmerich declares that he has no conflict of interest. Dustin A. Deming has received clinical trial funding from Merck, and has received compensation from Bristol-Myers Squibb, Genentech, Bayer, and Array Pharmaceuticals for service on advisory boards. Segelov E, Earle C, Venook A, Saskin R, Mofid L, Singh S. 587PSurvival by sidedness of metastatic colorectal cancer (mCRC) treated with epidermal growth factor receptor antibodies (EGFR-Ab) in the refractory setting: A population-based study of 1509 patients. Ann Oncol. 2017;28(suppl_5)): v158–v208. https://doi.org/10.1093/annonc/mdx393. Overman MJ, Kopetz S, McDermott RS, Leach J, Lonardi S, Lenz H-J, et al. Nivolumab ± ipilimumab in treatment (tx) of patients (pts) with metastatic colorectal cancer (mCRC) with and without high microsatellite instability (MSI-H): CheckMate-142 interim results. 2016;34(15_suppl):3501. https://doi.org/10.1200/JCO.2016.34.15_suppl.3501. Overman MJ, Bergamo F, McDermott RS, Aglietta M, Chen F, Gelsomino F, et al. Nivolumab in patients with DNA mismatch repair-deficient/microsatellite instability-high (dMMR/MSI-H) metastatic colorectal cancer (mCRC): Long-term survival according to prior line of treatment from CheckMate-142. 2018;36(4_suppl):554. https://doi.org/10.1200/JCO.2018.36.4_suppl.554. Kopetz S, McDonough SL, Morris VK, Lenz H-J, Magliocco AM, Atreya CE, et al. 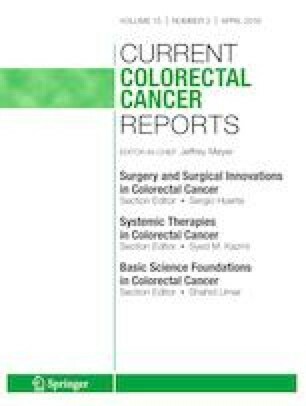 Randomized trial of irinotecan and cetuximab with or without vemurafenib in BRAF-mutant metastatic colorectal cancer (SWOG 1406). 2017;35(4_suppl):520. https://doi.org/10.1200/JCO.2017.35.4_suppl.520. • Cutsem EV, Cuyle P-J, Huijberts S, Yaeger R, Schellens JHM, Elez E, et al. BEACON CRC study safety lead-in (SLI) in patients with BRAFV600E metastatic colorectal cancer (mCRC): Efficacy and tumor markers. 2018;36(4_suppl):627. https://doi.org/10.1200/JCO.2018.36.4_suppl.627 An exciting ongoing clinical trial for patients with a BRAF V600E mutation which promises to be a new clinical practice for this subset of patients.